There are many hiking trails to be found all around the world, allowing people to stretch their legs, work their muscles, and feel at one with nature as they roam through beautiful landscapes and admire the stunning views all around them. Adored by nature lovers and outdoor enthusiasts of all ages and backgrounds for many generations, hiking trails offer wonderful ways to spend some free time, but few trails can compare with the incredible Mountains to Sea Trail. Running for an incredible total of 1,175 miles all the way across North Carolina, this long-distance trail starts off in the Great Smoky Mountains and finishes up at the Outer Banks barrier islands. The trail's westernmost point is Clingman's Dome, one of the Great Smoky Mountains, where it then joins up with the famous Appalachian Trail. Its easternmost point is on a large sand dune in Jockey's Ridge State Park. 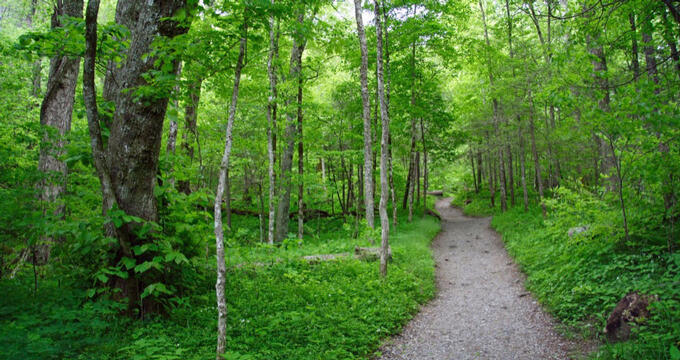 The trail, traditionally known as the MST, is part of the North Carolina State Trails Program and is classed as the 'backbone' of the North Carolina trail system, with many other trails spreading out from it along the way, like branches on a tree. Due to its incredible size, the MST is still a work in progress, with countless volunteers spending their own free time and effort in order to plan out and extend the trail, forging a footpath that will be walked and enjoyed by many generations to come. The beautiful thing about the MST is that, because it is so long and diverse, it can be enjoyed and experienced in many different ways. Naturally, the biggest challenge of all is to walk the entire thing. It’s a very big undertaking, but some people do actually pull it off, traveling at their own pace and planning camping stops along the way to break the journey up into small segments. There really is no better way to experience the rich beauty and majesty of North Carolina than walking the MST, but you don’t have to hike along the entire thing to enjoy it. Many people simply stop off at the MST and walk along relatively short sections of it. This can be a great way to simply spend some free time at a weekend or on a special occasion. There are 18 different trail segments along the MST, stretching out through the mountains, the Piedmont region, and the coastal plain/Outer Banks area. The MST passes near many major NC cities like Raleigh, Durham, Greensboro, Winston-Salem, Asheville, Boone, Goldsboro, Jacksonville, Fayetteville, and Wilmington, so it's always relatively easy to access, no matter where you happen to be. All you need to do is pick a spot and head out to enjoy it. There are many different activities to be enjoyed along the MST aside from simple hiking. Backpacking is very popular here for people who are looking for a more intense expedition and really want to spend a couple of days and nights out on the trail. Kayaking and paddleboarding can be enjoyed at certain segments, like out in the Elkin Valley or on the Neuse River, and road biking can also be enjoyed in areas like Hanging Rock State Park, Eno River State Park, and the Elkin Valley. If you'd like to learn and experience a little agricultural history, try the 'Land of History' route along segment 14B of the MST, and you can even enjoy the trail by horseback in regions like the Beacon Heights and Pilot Mountain State Park. The MST is managed and looked after by an association known as the 'Friends of the Mountains to Sea Trail'. The Friends work all year long to preserve, enhance, and enrich the trail for all. They work to maintain the trail, as well as positioning themselves along the various segments to act as guides for the many hikers and backpackers who travel along the route. They also run fundraisers to help support the trail and even get in touch with elected officials at both local and federal levels to try and raise awareness of the MST and underline its importance to North Carolina, and there are many different ways you can help out, with one of the simplest options being to simply donate some money and become a member. Donations can be made online with ease and you can become a member for just $35 (or only $20 for students). Membership comes with various benefits like newsletters, special events, a discount on all MST merchandise, and the good feelings that come from knowing you're supporting a noble cause. - Become a ‘Trail Angel’ to help out with people who hike along the trail, offering accommodation, food, and other services to support long-distance hikers. - Help out with building, cleaning, and preserving the trail for future generations. - Help out at festivals and fundraisers, working in booths or participating in events to help raise money and awareness for the MST. - Help out directly in the Friends of the MST headquarters in Raleigh. - Run your own fundraisers or awareness events to help people learn more about the MST and pledge their support.